On the morning of August 4, 1962 Monroe had been up for hours when her housekeeper, Eunice Murray and her personal publicist, Pat Newcomb, who had spent the night, stirred at 9 A.M. Leaning against the kitchen wall in a terry cloth robe, Monroe became cross with Newcomb. 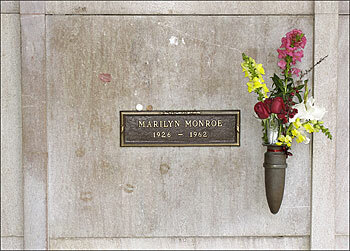 "I had been able to sleep and Marilyn hadn't," said Newcomb in an interview. "When I came out looking refreshed, it made her furious." "Marilyn had calls that morning, and by the time I saw her she was in a rage," Newcomb said. Some believe the phone calls were from Peter Lawford and Bobby Kennedy, in that order. Several other disturbing calls had come intermittently during the night, in which a female voice screamed, "Leave Bobby alone!" According to some speculators, Robert Kennedy arrived at Monroe's home the afternoon of the fourth. Hollywood detective Fred Otash claims that, "Marilyn and Bobby had a violent argument and she told him that she felt used and passed around. At the end of the argument Marilyn ordered Bobby out of her house. After the visit Monroe was so distraught that she summoned her psychiatrist, Dr. Greenson, for a 90 minute session--which probably involved an injection of barbiturates similar to one given to her by her internist, Dr. Engleberg, the previous afternoon. By 5:30 P.M, her analyst had left Monroe. Afterward, she talked to her stepson, Joe DiMaggio Jr., and her friend Jeanne Carmen, among others---none of whom believed she was depressed or on drugs. Informed sources believe Monroe died before midnight, August 4. Housekeeper Eunice Murray found the body and called Ralph Greeson. When publicist Arthur Jacobs, Pat Newcomb's boss, received word, around 10:30 P.M., he rushed to Monroe's house. The first call from Monroe's house to the outside world came six hours after Arthur Jacobs had been notified. Police sergeant Jack Clemmons was on watch at the West L.A. substation, less than three miles from Monroe's home, when, at 4:25 A.M., the telephone rang. At first the caller, Dr. Ralph Greenson, was so agitated that Clemmons couldn't understand him. "Marilyn Monroe is dead," the psychiatrist said, "she just committed suicide." When Clemmons arrived at the scene, Eunice Murray led him to the bedroom and gestured toward Monroe's bed. "Marilyn was lying face down in what I call the soldier's position," said Clemmons. "Her hands were by her side and her legs were stretched out perfectly straight. It was the most obviously staged death scene I have ever seen The pill bottles on her bedside table had been arranged in neat order and the body deliberately positioned, It all looked too tidy."